Baptismal kit for boys, in a very original design, with hats, whiskers, and bowtie. 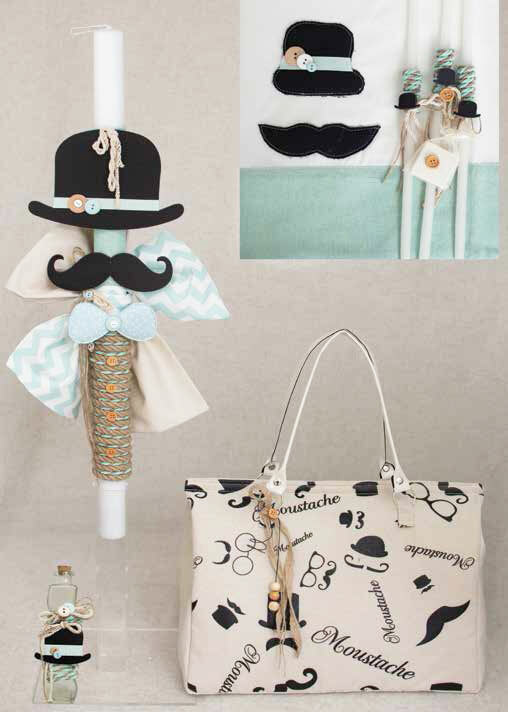 On top of the candle with a very beautiful and elegant tie with thick brown textile rope are placed a big hat, a mustache and a wooden blue bow tie. The towel is also decorated with a hat and mustache and a blue band. The big bag - suitcase has a black and white pattern also with hats and whiskers. The set includes: candle, big-bag suitcase, three candles, soap, bottle of oil, laurel, underwear and towels. https://www.preciousandpretty.com/2018/07/mustache-christening-set-for-boys-E818.html Greek Wedding Favors|Orthodox Crowns|Stefana|Baptism Invitations Mustache Christening set for boys E818 Baptismal set for boys, with hats, mustache, and bowtie. Product #: Greek Wedding Favors|Orthodox Crowns|Stefana|Baptism Invitations_3228173196456470051 5 stars out of 5 reviews.